I just love green beans, especially in the summer time when they are fresh from a local farmer’s market and filled with incredible flavor. Perhaps you can relate, but the other day I went a little overboard at the farm stand and bought way too many green beans. “We can eat all this,” I thought. Well, by day four of eating them either baked in a drizzle of olive oil or simply steamed, I decided that I needed a new method of preparation, and soon. Wanting to keep it simple, I decided to sauté these beautiful green beans with some cherry tomatoes that were on their last leg sitting on my counter, as well as a few mushrooms and garlic in a little olive oil. Let me tell you, it was delicious. 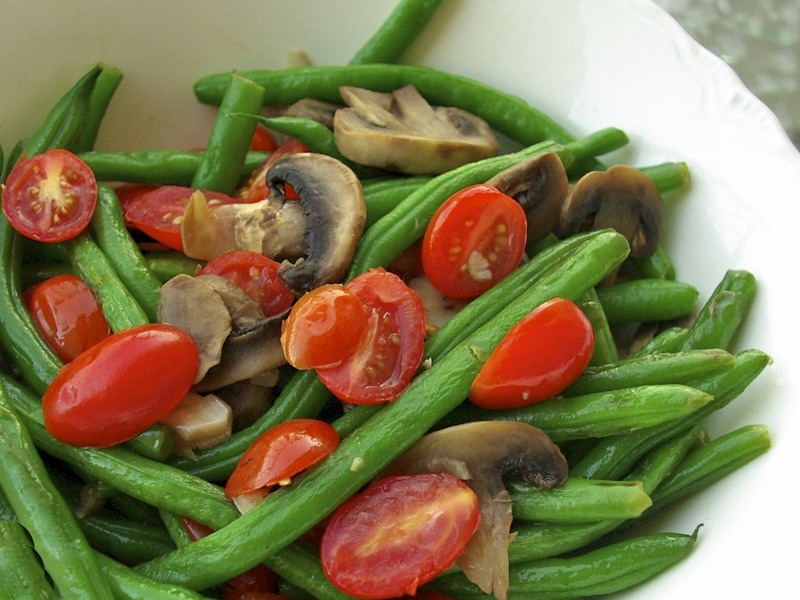 With perfectly tender, crisp green beans, a subtle hint of garlic, juicy bursts of fresh tomato and that wonderful meatiness that only mushrooms provide, this dish is packed with flavor and makes a perfectly fresh side dish for any busy weeknight. Enjoy! Is your garden overflowing with veggies? What are you growing? Let me know below! Paula’s Notes: Slicing cherry tomatoes can be a chore, check out my quick “how-to” video to learn how to cut all of the tomatoes at once! Check out my “how-to” video above for an easy time-saving tip! Heat 2 tsp. olive oil in a large nonstick skillet over medium high heat. Add green beans and mushrooms and cook, stirring often, until seared in spots (about 2-3 minutes). Add broth or water and cover – reduce heat to medium and cook, stirring occasionally, for about 3 minutes for crisp tender or 6 minutes for tender. Push beans to the side, add remaining tsp. of oil and garlic and cook until fragrant (about 30 seconds). Add tomatoes, stir everything together, and cook until tomatoes begin to break down – about 2-3 minutes. Remove from heat, add vinegar, if desired. Season with salt and pepper to taste.